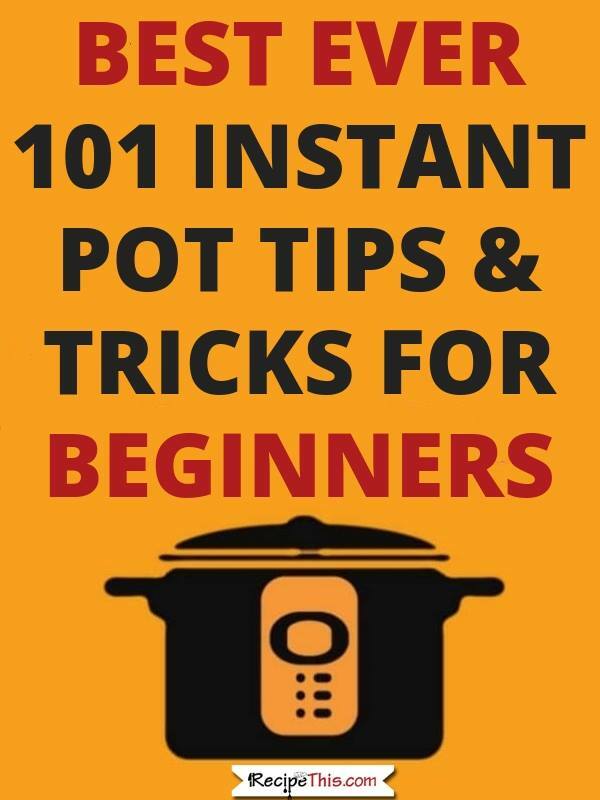 101 Instant Pot Tips & Tricks For Beginners. I asked my readers during the process of buying and trying out their first Instant Pot Pressure Cooker, what they really wanted to know. 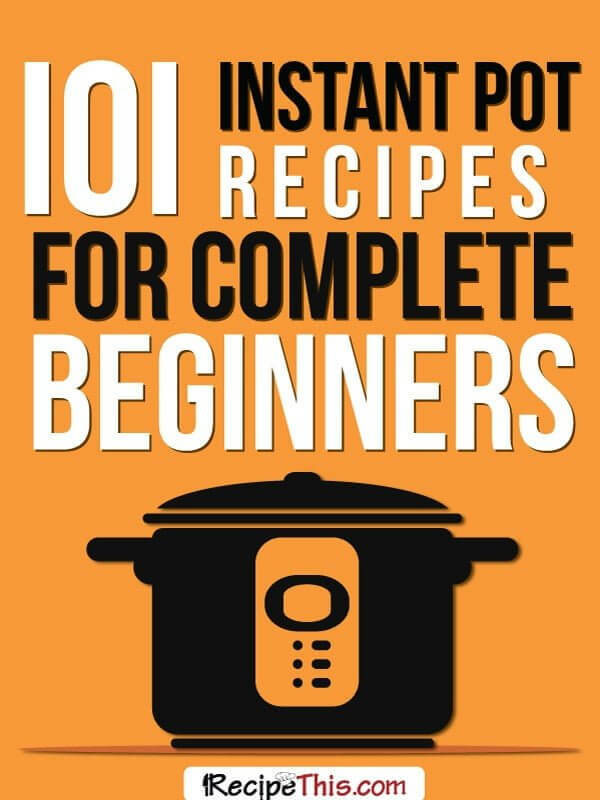 These are the results narrowed down from more than 1000 Instant Pot Beginner questions including plenty of tips and tricks to get you started. If you have visited recipethis.com before then you will know that we love our Instant Pot Pressure Cooker. We bought our first during the Black Friday deals of 2016 and have loved it ever since. We loved our Instant Pot so much that it came camping across Europe with us, cooks a lot of our family meals and makes us the most amazing desserts. I never realised when I bought it, the impact it would make in my life and how much I would truly love it. But when we first got it, after memories of those exploding stove top pressure cookers of the 80’s we were nervous about using it and had that beginner million questions going on in our head. So, we decided to ask our readers what they would love to know from the start, as well as the questions I wanted to know when I got mine, to give you the top 101 Instant Pot Tips & Tricks For Beginners to help you out a bit. Does the instant pot vary much from a regular electric pressure cooker? No they are the same thing. Instant pot is just a brand that makes electric pressure cookers. Other brands work the same way. Features will vary between brands, but they all work the same way. What about in comparison to a stove top pressure cooker? They are some what different from a regular manual pressure cooker. If you are considering a stove top pressure cooker, then have a read of my stove top vs electric pressure cooker guide. Instant Pot Vs Slow Cooker – The Instant Pot is a pressure cooker and cooks everything FAST where as a slow cooker cook everything SLOW. Both produce tender meat and enhance the flavour of your cooking. I would recommend having both in your kitchen. What kitchen gadgets can you ditch when you get an Instant Pot? You can get rid of the yoghurt maker, rice cooker, egg cooker, soup maker and food steamer. Though we still have our soup maker for some baby food making. What kitchen gadgets do you recommend that I keep after getting an Instant Pot? In an ideal kitchen you would have an Instant Pot Pressure Cooker, an air fryer, a slow cooker, a blender and a bread maker. We have all of these in the Milner kitchen as well as a 2nd slow cooker, a 2nd Instant Pot and an ice cream maker. Why do so many people recommend the Instant Pot? Ease of use. Easy to travel with. It is also a high-quality product that can get dinner on the table in a flash. I was on the fence about the Instant Pot until I cooked my first meal in it. Can the Instant Pot help me lose weight? Absolutely! The Instant Pot is perfect for cooking a lot of meals without any fat. It is also perfect for cooking healthy foods from scratch such as beans, lentils etc. It also cooks a lot of vegetables in just 2 minutes. You’ve got my attention what else can it do? You can use the Instant Pot to make dog food, baby food, broth and its famous for homemade yoghurt! Does the Instant Pot really speed up the cooking process? Yes it does. Just think of how long it takes you to cook dinner and then imagine a dump and go 10-minute meal. Or rice pudding, or homemade caramel, or quick hard-boiled eggs. The list goes on and on. What size Instant Pot should I buy? We bought the 6 litre and also have the 8 litre. We find that for every day regular family meals for the 5 of us, the 6 litre is perfect. But if I am cooking a large piece of meat, it might not fit in. For example, for Thanksgiving and Christmas a turkey crown (aka bone in turkey breast) will not fit properly. The same could be said if you are cooking a large rotisserie chicken. I would recommend the 6 litre for the average family, the mini for one person or for camping and the large 8 litre if you want to do a lot of bulk cooking or are a family of 7 or more. Litres Vs Quarts – You will see on the internet that some Instant Pots are referenced by 6 litres and some by 6 quarts. It means the same thing. 6 quarts is imperial and 6 litres is metric. Can anyone tell me the difference between the LUX and the DUO? Duo has high and low pressure along with a yogurt feature. If you want to cook rice or yogurt then you will need to upgrade to a Duo model. But if both of these don’t appeal to you then stick with the Lux. Why is it called Instapot? Its just a shortened nickname that some people use when they refer to the Instant Pot. It still means the same thing and you can use either to describe it. What can the Instant Pot NOT do? An Instant Pot can’t blend your food, so don’t expect smooth soups. It can only crisp using the sauté setting and it can’t deep fry. That is why I also have a soup maker, blender and an air fryer in my kitchen too! I bought my Instant Pot 3 months ago and it is still sat in its box. I still have nightmares of it exploding like my Grandma’s did during the 80’s. Please can you help me get started? Electric pressure cookers (especially the Instant Pot) have a lot of built in features that safeguard you. They are not like what we had 30+ years ago and are so much easier to use. I recommend that you start with the Instant Pot water test and then cook something simple like Instant Pot Butternut Squash to get you used to it and ease you in gently. I don’t want to do the water test! I often get asked what is the point! Well its like when you go to have your hair coloured and they do a patch test first to see if you’re allergic. You could take the risk or ruin your head. With an Instant Pot its better to check your Instant Pot is going to pressure and working properly, before you place your nice food in it! Do you need all the accessories that come with it? When we got our Instant Pot it came with a couple of spoons, a measuring cup, a condensation collector and a trivet. We use the trivet a lot for when we are steaming vegetables or when we are making recipes using the spring form pan. But I don’t think we have ever used the spoons. What Instant Pot accessories do you recommend that I buy? I would recommend that you look at our full list of Instant Pot Accessories to use with your Instant Pot. For example, the steamer basket for cooking vegetables, the spring form pan for cheesecakes and ramekins for cute little desserts. Though there are many more you could use too. If there was just one accessory you should buy, then it should be the sealing ring. If your sealing ring needs replacing you can’t cook in your Instant Pot. Always make sure you have a backup one available. We didn’t. Then when we were camping we had no backup and had to wait on an Amazon delivery. Is it easy to convert Instant Pot recipes? Yes it is. We have a handy Instant Pot converter that you can use to convert all your favourite recipes to the Instant Pot. Why are there so many buttons on the Instant Pot? It’s all about ease of use. Just think of the Instant Pot like a microwave and all the different settings you used to get on a microwave. With a microwave you had all these buttons and often either cooked or defrosted. Well the Instant Pot is the same. You use manual a lot or low pressure for your rice. I see many of the Instant Pot recipes call for manual, but I have no manual button on my Instant Pot? This is because modern versions of the Instant Pot replaced this button with pressure cook, so just press “pressure cook” instead. Why does nearly every recipe call for manual? That is because its often quicker to key in 6 minutes than it is to adjust the time on a pre-set option. Why do recipes call for high pressure rather than low pressure? Electric pressure cookers like the Instant Pot are not as powerful as stove top pressure cookers and high pressure on an electric is not as high as you would think. Therefore, low is only needed for food that needs cooking gently such as rice and other similar grains. What is the minimum amount of liquid that you need to come to pressure? Generally, it is 1 cup which is just short of 250ml. But if you are cooking a very small amount of food then you can half this amount. Also, if you are pressure cooking food that has its own liquid then you often don’t need to add any liquid at all. For example, when I make recipes using tinned tomatoes. Also, if you are cooking a stew you often have a big broth with it. These take ages to go to pressure because of the amount of liquid but is worth it for the finished dish. My Instant Pot makes a lot of noise when coming to pressure, is this normal? Yes it is. We often notice that our Instant Pot is very noisy until the pressure starts and then it is super quiet until the cooking time has finished. How do you set the valve to sealing? There is a knob at the top of the Instant Pot. After placing the lid on the Instant Pot you move the valve to sealing from venting. Then it will help it go to pressure. If you don’t do this, it wont pressurise. To Manually release pressure you simply do the opposite. You move the valve from sealing to venting and then wait for the pressure to release and for the steam to stop coming through. This is also referred to as quick release. To complete natural pressure release you would wait until the valve pops up naturally (usually 15 minutes), wait until the steam has gone and then remove the lid. This is rarely practiced in Instant Pot recipes as manual pressure release is more common. Will I burn myself releasing pressure? I have been releasing pressure for nearly 2 years and have not had a single incident. Though I don’t keep my hand over the steam and move my hand away as soon as possible. You could put a tea towel over the area as you do it if you feel nervous about it. My Instant Pot is leaking from the sides of the lid? This means that you need to replace your sealing ring. We learnt that ours needed replacing while camping and got a next day delivery order in with Amazon. How many spare sealing rings should I buy and how often will my sealing ring need replacing? This always comes down to what you are cooking in your Instant Pot and how often you are using it. We replaced our sealing ring twice after having it for 19 months, with a lot of activity. What is the purpose of the Tempered Glass Lid for the Instant Pot? For slow cooking and anything cooking that does not need the pressure cooking option. Yet I should say now that I have never bought one and never really felt the need for it after 2 years with an Instant Pot. How long does it take for the Instant Pot to come to pressure? This varies from recipe to recipe. If your Instant Pot has more liquid or a lot of food in it, then it will take longer, just like if you are just steaming some vegetables it will be faster. The majority of the recipes we cook in our Instant Pot the general time is 11 minutes. If I double the recipe, do I need to double the liquid and double the cooking time? Not necessarily, it just depends on how full the Instant Pot is. If it is overcrowded and full to the top, then you will need to adjust the time. But if you are just changing it from 4 chicken breasts to 10 chicken breasts, then the same liquid and timings would apply. Can I cook frozen meat in the Instant Pot? Yes you can. Plus, by the time it comes to pressure the Instant Pot will have thawed it for you. Does the cooking time change with frozen food? The biggest difference that I have found is that its how long it takes to come to pressure that’s the biggest issue. The frozen item needs to gain steam and will take longer because of this. I also find that if you have a thick piece of meat that you will need to add extra cooking time. It comes down to what you’re cooking and the size of it. Is the default time of 30minutes on Manual? Yes it is. But you can just adjust the time with the + or – depending on how long the recipe is that you’re cooking. It also remembers the time. So, if you are cooking for 6 minutes twice on the same day, it will start at 6 minutes until you adjust it. Would you trust your instant pot to let it cook for 30-45 minutes while you are not home? No I wouldn’t. Its still an electrical device and anything can happen. Besides from that, what if it wasn’t cooked and needed extra time? Or didn’t come to pressure? You would want to be there to deal with any problems. Do recipes include time to come to pressure? Very rarely. Though most of the time recipes don’t take that long to come to pressure. Its only when you’re doing a large item such as pulled pork, beef stew, that it takes a while. So, do bear in mind the time to pressure when you plan what time you want to eat dinner at. What if my food doesn’t go to pressure? This has happened to us all. Sometimes it is a technical fault and sometimes it’s a lack of liquid in the Instant Pot that is preventing it from going to pressure. Sometimes it will still cook even without the pressure and your food will be 75% cooked. In these circumstances I recommend putting it back on to finish the cooking time and making sure there is adequate liquid. When you put it back on it doesn’t take as long to go to pressure as everything is already warm. Can you stop and restart the cooking process? Yes you can and I do so sometimes. Take for example our popular Instant Pot Salmon & Broccoli. We stopped the Instant Pot to add the broccoli so it didn’t turn to mush. It took little time to get back to pressure and was an amazing meal. How do you know when your Instant Pot has come to pressure? The valve will be pushed up and steam will no longer escape. Your Instant Pot will also have started to count down. It will no longer say “on” but will have a number instead. For example, if you’re cooking for 10 minutes it will say 10 as soon as it goes to pressure. What is a trivet? A trivet is the cooking shelf that comes with your Instant Pot pressure cooker. You place it inside the Instant Pot inner pot before cooking. Then its easy to rest a steamer basket on top of it. Or you can use it for placing your spring form pan over. Its only essential for pot in pot Instant Pot cooking. What kind of dishes can you use in the Instant Pot? Anything that will fit in your Instant Pot and is also oven safe. For example, we love using our ceramic dishes and our ramekins in our Instant Pot. Though avoid really heavy items as these have been known to break such as stoneware. Can I put a glass Pyrex bowl in my instant pot on top of the trivet? Technically yes because if something works in the oven and is oven proof then it should be pressure cooker proof. But those at Pyrex warn you against doing so. There is also a lot of different opinions in the Instant Pot Community over whether or not its acceptable to do so. Can I wrap something in foil and cook in IP? Yes you can. I love to do foil packet style dinners in my Instant Pot. Not only does it save you time in washing up, but the food tastes a lot better as it is containing the great flavour. Simply add the liquid to the bottom of the instant pot. Place foil packet food on the trivet and cook! Try my no washing up Instant Pot Chicken Wings. Can the instant pot be used as a deep fat fryer? No it can’t and please don’t try you’ll break it! What I suggest instead is that you invest in an air fryer to use for cooking alongside your Instant Pot. We have the Philips XL and its perfect for cooking your sides in, while your Instant Pot cooks the meat. Or vice versa of course. How do you crisp food in the Instant Pot? Treat it like you do when you sauté meat before you slow cook it. Do the exact same but sauté in the Instant Pot first instead. Place it on the sauté setting, wait until it gets warm (a minute or two) then sauté it with a tablespoon of olive oil. It will not be crispy like a deep fat fryer but will be in between. For sauté I only have to click the button on right? Why it is not getting hot? Press the sauté button and wait until it says HOT. It will take a few minutes. There are also 3 levels, less, normal and more. For most things when sautéing, I use “more”. Instant Pot terminology is so confusing! That is what we thought when we purchased an Instant Pot. In fact, we have put a huge list together for you listing them all. Click here to access our full Instant Pot Terminology references. How do I get rid of the smell on the sealing ring? Mix a little water with some vinegar and using a cloth, give the sealing ring a quick clean. The smell soon goes. Or, place a cup of watery vinegar in the Instant Pot and bring to pressure for 1 minute, the Instant Pot will smell as good as new! Plus, it can solve the problem of a colour change in your Instant Pot. How do you clean your Instant Pot? Here is an excellent guide for beginners of how to clean your Instant Pot or any other pressure cooker. I cooked with my Instant Pot and some food got stuck on the bottom and I have scrubbed, my husband has scrubbed, we have soaked it 3 times and it is not coming off! Any ideas of how to get it off?? Bar Keepers Friend and a scrubber or you can use Mr Clean Magic Eraser. All you must do is make sure that you use something that won’t cause the stainless steel to scratch. As its important that the Instant Pot remains non-stick. How long can you use the keep warm function for? I would recommend up to 10 hours. For example, you could cook your meal in the morning and keep it warm while you’re at work. Or you could cook breakfast the night before or keep party food warm during a party. Do you use cooking spray in your Instant Pot? No absolutely not. It will create a film of the stainless steel that builds up over time and is nearly impossible to remove. Cooking spray has been known for ruining a lot of pots and pans when used so do try and avoid it. Is natural release, basically just letting the food sit in the instant pot for like 15 minutes without venting? Yes it is! This is how it should be explained to every newbie of pressure cooking. What is the benefit of the natural pressure release (NPR) as opposed to quick release? They say it keeps meats much juicier than quick release and prevents a mess when you have used creamy liquids. Personally, I only like it for cheap cuts of meat, for everything else quick pressure release (QPR) works much better. Is it normal to have little puffs of steam occasionally come out of the float valve when pot is still building up pressure? Yes it does that until it seals. It depends on the amount of liquid and what you’re cooking to how often you will see this happen. Anyone else have any issues with the slow cooker feature on their Instant Pot? I think everyone does. What is not explained to Instant Pot Beginners is that the slow cooker temperature is the same as keep warm on a classic slow cooker. You must adjust the temperature to get it to slow cook properly. I did it! Poured water into the pot without the liner! Immediately realised it and turned it upside down…how long do I wait to try and use it? I would recommend 72 hours. We had a similar problem this summer. Our son kept pouring his leftovers into the bottom and we soon learnt to put the Instant Pot on top of the car while we ate dinner. I find that most recipes are for the 6 litre Instant Pot. What adjustments do I need to make for my 8 litre? It might take just a bit more time to come to pressure, but you don’t have to make any adjustments. I am a larger family and cooking for 7 people not 4. A lot of recipes are based on feeding between 2-4 people in the 6 litre. If you’re cooking for more, just double the recipe and if you can use a 8 litre. I recommend the 8 litre for big meals as it stops overcrowding problems. Can I use an Instant Pot to reheat food that was in the fridge? Yes you can re-heat in the Instant Pot. I use the Pot in Pot (PIP) method. Plus depending on what it is I am reheating takes between 0 and 3 minutes. Can I cook freezer meals in the Instant Pot? Yes you can. If you plan on doing this on a regular basis then I would suggest you look into what freezer containers you own and planning a day of freezer cooking. Can you travel with your Instant Pot? Yes you can. We took our Instant Pot across Europe this summer and used it at several campsites along the way. Here is our tips post for how to travel with your Instant Pot. There are so many questions asked about Instant Pot recipes and we can’t answer them all, but we have selected a few to get you started. Especially, regarding making yoghurt in the Instant Pot which comes up a LOT. We also recommend you check out our 101 Instant Pot Recipes for beginners to get you started. I want to cook yoghurt but have no yoghurt setting? One of my readers suggested that you can wrap it in towels instead to keep the heat and it works great. Everyone says Fairlife for their yoghurt but its not available outside the US? Fairlife is only one of the many milks that you can use for the Cold Start method. The equivalent of Fairlife in Canada is Natrel Lactose free milk. It is the additional protein in the milk from the filtrations process that helps make a thicker without straining. Why does my yoghurt look so curdled/chunky? This is because you have stirred it at the wrong time. Or it can be a texture issue from using too much starter. How long does Instant Pot yoghurt keep in the fridge? For about a week. Yoghurt makers, what do you do with your spare whey? One of the nicest uses of spare whey is to use it as a substitute for buttermilk. You could use it to make flaky buttermilk biscuits or how about breaded chicken? When making cold start Greek yoghurt, do you strain it immediately or after it sets in fridge for 4 hours? You should strain it straight away and before you place it in the fridge. I would like to make a non-fat yoghurt. Is this even possible? Lower fat milks have a higher water content, so if you like a thick yogurt, you’ll want to add non-fat instant powdered milk and/or strain it. Can I make yoghurt in a larger bowl set it in the Instant Pot? Should it be glass or can it be stainless steel? I do it in mason jars in the inner pot. I don’t have to touch it after incubation as I just put the jars in the fridge! Can I use a regular colander to strain yoghurt if I line it with coffee filters first? I want to make a thick Greek yoghurt. That’s pretty much what I used. I have to say, I wasn’t wild about it, but it worked. I wanted to try the straining part before investing in anything and it works. Can you use the yoghurt you have already made for your yoghurt culture for new batch? Absolutely! Every time just save 1/2 cup. I have yogurt starter & sourdough starter in my fridge. Been going for ages. Can you freeze your leftover cheesecake? We never have any left to freeze, but it can be easily frozen. Many families freeze them and then take out a few slices at a time when needed. Do I really need to let an instant pot cheesecake cool for 12 hrs? I cool it on the counter for an hour. It’s in the fridge for about 5-6 hours. That’s about it. We have never placed ours in the fridge for 12 hours before and its always tasted fantastic. Do you remove your cheesecake from the pan before or after you chill it? After it chills and sets, otherwise you might have a wobbly accident with it or it might not come out right. Do you have some cheesecake recipes for me to try in the Instant Pot? Yes we do! We have raspberry cheesecake minis, Instant Pot Strawberry Cheesecake, Instant Pot Pumpkin Cheesecake and Instant Pot Oreo Cheesecake. If I plan on refrigerating the eggs instead of peeling them, do I need to do the ice bath? I have done both and there is no difference. If I would like to hard boil 2 dozen eggs at once, does 5-5-5 still work or should I up the time a bit? Still 5-5-5 I did 4-4-4 today and they were even better. Plus, you can do up to 50 eggs at once depending on the size of your Instant Pot. What’s the 5-5-5 method for eggs mean? Five minutes on high pressure, 5 minutes natural release and 5 minutes in cold water – perfect every time for me! I have heard of an egg method that involves no peeling and makes perfect eggs for egg mayo is this true? Yes it is and we have it on the blog! It takes just 7 minutes to make our famous egg loaf in the Instant Pot. I wanted perfect baked potatoes in the Instant Pot but they are hard? The easiest method is to cook them for 30 minutes on manual pressure. Fork them before you cook them so that they can breathe and rest them on the trivet. No natural pressure release and perfect Instant Pot Baked Potatoes. Anyone have a great recipe for shredded chicken from frozen chicken? Yes. Here is our Instant Pot Shredded Chicken recipe. Its an easy use of frozen chicken breast alongside tinned tomatoes to stop them from going dry. Can you cook ground beef in the IP, for like spaghetti and sloppy joes, that kind of stuff? Yes you can. One of our favourite Instant Pot recipes this summer was our Instant Pot Sloppy Joes. How does soup work? Do you literally just put it all in and press the “soup” button? What if there are veggies and pasta in it? And how much liquid do you add? For making soup its best to use the manual button. Recipes vary for times with soup and its just easier to press manual and then set your desired minutes. Aim for the amount of liquid you would like in your soup i.e less for a creamy soup and more for a broth based soup. When cooking rice what is the liquid to rice ratio? It varies depending on the type of rice but it often follows the 2:1 ratio. I.e. 2 cups of water to 1 cup of rice. Why does my chicken come out rubbery? This could be because you’re cooking it for too long, or that it doesn’t have adequate liquid around it, in order for it to cook efficiently. Why does my pasta always stick to the bottom? This would be because you don’t have enough liquid in your pot, or because you have over cooked it. Think about when you cook pasta on the stove. If it is overcooked or if you have not added enough water it will stick to the bottom. How long do fresh green beans take to do in the Instant Pot? For Instant Pot Green Beans they take just 2 minutes to cook and even with a delicious garlic butter sauce only take a minute to prep. How long should I pressure cook baby potatoes and how much liquid? You can cook your baby potatoes for 4 minutes and then use natural pressure release. I also recommending using 160ml of warm water. How long would you cook cauliflower florets in the instant pot? For Instant Pot Cauliflower you’ll be pleased to know that it takes just 2 minutes for perfect steamed cauliflower in the Instant Pot. Other than pea soup, what can a ham bone be used for? You could use it to make a creamy vegetable, bean and ham bone soup. That’s my favourite way and it tastes so good and can be frozen for later. Please tell me how to cook baked sweet potatoes in the IP? Is it the same as regular baked potatoes? I find that Instant Pot Sweet Potatoes need less time compared to white potatoes. Tried to make popcorn, why is it not popping? When making Instant Pot Popcorn this can only happen when the Instant Pot is not hot enough. Please make sure you follow our recipe and that your pot gets hot enough. Why I my beef tough? This is always come down to it not been cooked for long enough. I could put beef in the Instant Pot for 10 minutes and it would be cooked but it wouldn’t be tender. Instead cook it for about 40 minutes and you would have delicious tender beef stew. Why is my Instant Pot food bland? When you pressure cook it creates pressure to the food and dilutes flavour. If I was converting a regular recipe to the Instant Pot, I would suggest doubling or tripling the seasoning to make allowances for pressure cooking. Or my favourite option is to add the majority of the seasoning at the end. My Milk Exploded! This is a common problem with the high pressure of the Instant Pot, especially when you use QPR. I recommend that you add the milk at the end when the pressure has finished or cook on low pressure. If you have your own recipe question that you would like answering about cooking in the Instant Pot, please comment at the bottom of the post and we will add it to the list. 101 Instant Pot Beginner Recipes – Our now FAMOUS Instant Pot Beginner Recipes that has been updated for 2018 and full of beginner recipe ideas. 101 Instant Pot Chicken Recipes For Beginners – If you love chicken then you will love our beginner chicken recipes. They are so delicious you’ll wonder where to start. 101 Instant Pot Beef Recipes For Beginners – Or for the beef lover, you’ll love this thorough collection of beef recipes.